It is always sad when a dog gets lost, but you can give yourself the best chance of finding your best friend again by using this flyer. The attention-grabbing red and black theme will make sure as many people as possible see the flyer. 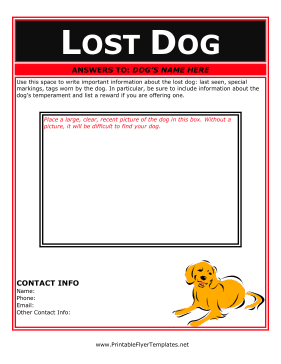 Additionally, there is a very large section for a picture, which is the most important part of a lost dog flyer. With a lot of flyers and a little luck, you may soon be reunited with your beloved pet.